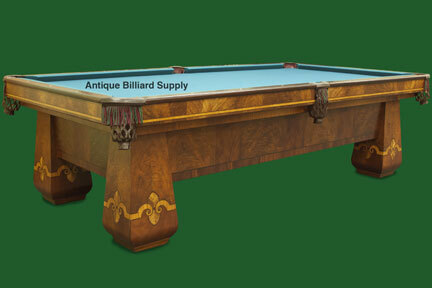 #2-14 Unusual and rare Brunswick antique pool table manufactured in the 1920s. This table combines panels of walnut burl with panels of swirled mahogany to achieve a uniquely handsome appearance. Extensive inlay of satinwood and ebony. The rosewood rail tops have round sights made of genuine mother-of-pearl. Nine-foot size with 3-piece Pennsylvania slate playing surface. Restored and available for sale.